2018 was a year of epic proportions in NXT. The landscape was truly changed as a series of stories unfolded within WWE's third brand, and these developments were ushered in by what many would call the most important feud of 2018, Tommaso Ciampa versus Johnny Gargano. With this feud between Ciampa and Gargano taking up the main continuity of the NXT universe for a good portion of 2017—spilling out to as recently as a few months back—NXT hit the jackpot when they capitalized on the solid fan support for Johnny Wrestling and his dynamic underdog persona. This would eventually lead to Ciampa becoming the most hated (yet probably most entertaining) man in NXT history—maybe even all of sports entertainment to date. As a briefer to this rivalry, Ciampa's descent to madness began when they lost their NXT Tag Team championships to the Authors of Pain at NXT Takeover: Chicago last year. What would follow after the match was a series of events akin to tales of trust, friendship, and betrayal, as a tired and beaten #DIY would walk up to the ramp to play to the fans, only for the Judas that is Tommaso Ciampa to turn heel on his former tag team partner. Today, we take a look at the arguably the most brutal between the two, both physically and emotionally—one which lit a fire under NXT and would, after a series of events, eventually lead to Ciampa’s current reign as NXT Champion. We zoom in to NXT Takeover: New Orleans, where the two faced for the very first time since that fateful heel turn. An "unemployed" Johnny Gargano versus a recently returned Tommaso Ciampo in what was sold as an unsanctioned match for Johnny's chance to regain not only his job, but also his dignity and sanity in that night's main event. When your main event doesn't even involve the show's main title, you know you're in for an experience like no other. Looking at these two men's history, you'd realize that this was a feud that would naturally garner #fightforever chants due to their inherent familiarity with each other. Dating back to their days from the indies up to their NXT roster appearance, to their tag team formation into #DIY and their eventual breakup, these two were the epitome of a good matchup (and that they were). Of course, this would be validated when the pair would receive a five-star rating from good old Uncle Dave Meltzer. Watching the match again, this would also mark the first time that Tommaso Ciampa would ditch the entrance music to get an almost organic negative reaction—entering the ring to the loudest chorus of boos. The boos themselves show how much Ciampa can get the best responses from the crowd and this truly was a great development for his character. Clearly, the two knew how to release the emotional baggage that each of them carried all throughout from Gargano still distraught about Ciampa's betrayal and Ciampa actually just wanting to ruin his friend Johnny-boy. Yes, it was much of a slugfest for the majority of the match, but were we bored? No. I think it's safe to say that everybody was invested in this match more than any other. The sheer brutality of the match would also be exercised as the match would spill outside of the ring. From TV monitors, to barricades, the announce desk, the ring apron to eventually, Ciampa's crutches—nothing was safe from this unending war between them. It was a pure battle between good (Gargano) and evil (Ciampa) but who were we to complain? This was what we waited for—pure unadulterated violence in the form of revenge. 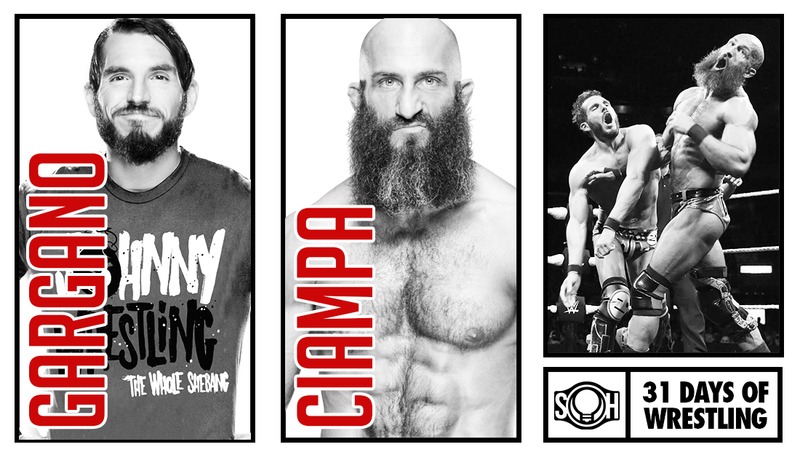 We wanted Ciampa to get his comeuppance in the worst way possible. I, for one, enjoyed seeing Ciampa get powerbombed to the concrete floor. I enjoyed every punch and every kick. I enjoyed the war of words. I enjoyed each exchange. At the end of the day, wrestling isn't just about athleticism or moves. It's about the story. And for this story, we wanted the good guy to win. Just as any good story starts to comes to a close, the comeback is the most important part. I cheered (in my mind) for Johnny to kick out of every pinfall, and kick out he did. Kicking out of powerbomb lungblowers left and right, Johnny started to mount his offense, eventually getting a hold of the crutches but a moral dilemma would once again face our Johnny. Johnny had a vision of himself being so enraged that he might as well be the same as Ciampa, which would be a foreshadowing of his future this year. Realizing his own descent into madness during the match, he dropped the crutches only for Ciampa to try and hit him with the knee brace. Of course, like a movie scene, this would backfire and would give Johnny the opening to finally lock in (for the nth time) a submission utilizing the brace to which our evildoer immediately taps out to. One point for the good guys as Johnny Gargano gets reinstated in NXT! These two would continue to square off in the coming months after this events, however, this would all seem to matter less now as #DIY seems to be back on the same page (or at least that's the way it looks like at the moment.) We'd have to wait and see what happens next, but that would be another chapter in the story—a story for a different time.